Yeah, I'm cool - just like daddy. 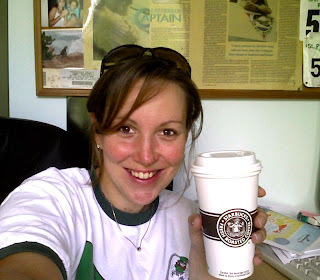 Do you think Guinness has a world record holder for most photos taken with a Starbuck's cup? Cause I could totally beat it. 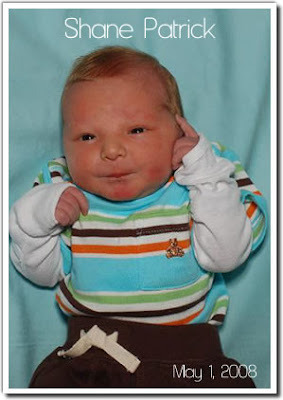 It's been a little hectic around here lately, but I thought I owed it to Shane to mark his 4 week birthday with a little recap of how things have been going this first month adjusting to a new family member in the house. With Bridget, I remember four days could seem like four years at times (sorry babygirl, you were quite the handful and, at the risk I could somehow do you reprehensible damage, I will follow that up with the fact that I wouldn't have it any other way) but this time has been flying by and, dare I say it, knock on wood, has been completely and totally manageable and you know what, not just manageable, but ENJOYABLE! Yes, there are times it is extremely hard - beyond hard - but in between those times there are the moments when Bridget cries because she didn't get to give "the baby" a kiss goodnight and then promptly lets out an "oooohhhhh" signaling she is about to give him a big bear hug - albeit this is sometimes dangerous for an 8 lb being, but adorable as hell nonetheless. Then there are the times when I actually figure out what is wrong with my little man and I feel like such an empowered, can-do-no-wrong mommy... well, that is until my daughter comes home, flops on the ground in a fit of rage over the fact that I DARED TO LET THE DOGS OUTSIDE - didn't I know that the dogs needed to stay inside, that the world was about to come to an end if I let the dogs out the back door? Luckily, I am usually able to chalk this behavior up to little daycare sleep and 21 months of age. Lastly, as we had hoped and have come to find out, this time is unequivocally, without a doubt, so much more relaxed. We are so much more okay with things and not overcome with questions, worry and guilt 24/7. Now, that certainly doesn't mean I don't experience all three of those things daily, multiple times a day, but in a much less stressful and overwhelming manor. Bottom line, things are going really well. I've only hid under the bed eating burritos once - twice maybe - okay, six times at the most, but it's still been a great experience so far and having this new little person in our lives is working out pretty well, I think we'll keep him. On an unrelated note, I've been totally remiss in not thanking Mark and Kim for the best new mom present ever - a Starbucks giftcard. I look so forward to this little treat in the morning and it's become part of Shane, Bridget and my's morning routine. Forgive me if that grammar is totally wrong in the last sentence, I always mess up my I's and my's - yes, I am an english major. Thanks guys - cheers to you! Lasagna: it's not just for dinner anymore. And even though I've never eaten that much lasagna in my life, I never got sick of it. In fact, I'll probably have a little lasagna withdrawal this week. I wonder if they make a lasagna patch - you know like a smoker's patch that delivers small doses of lasagna into your system so as not to completely quit one's lasagna addiction cold turkey? Hmmm... maybe that will be my first act as spokesperson of the NLA. ANYWAY, thanks again guys - it was delicioso - we really loved it and it was so above and beyond considering you have a newborn yourselves - we will be paying it forward very soon! So, this morning with the lasagna gone I returned to my regularly scheduled breakfast food - cereal and milk. I poured myself a HUGE bowl of Trix and filled it to the brim with delicious milky. As I was eating it watching the View (I know, I know, but I like it with Whoopi on it these days) I kept noticing this kind of stinky smell. Thinking it was surely just one of the 16 diapers laying around on the table, torn up by the dogs on the floor or in the pack and play, I kind of kept writing it off. Then, about half way through my cereal I start to think it might taste a little funny and then the sinking feeling set in... when exactly is this milk from? Worried about it, I make my way to the fridge (mind you I take another bite or two just to confirm that the smell and taste is in fact coming from the bowl) to find that yes, indeed, this milk would have tasted much BETTER BY May 8, 2008. So as not to gross you out entirely, I won't go into detail about the thick, goey rim on the sides of the milk jug that probably means no one has even touched this milk since before Shane arrived. I can't believe I'm spending today playing with pictures of my NEW NIECE! It's just too crazy! And, OH MY GOD, I have a new NIECE... wait I have a niece PERIOD. I never had one before and it's so awesome. And she's so B-U-TIFUL. Sorry for all the UPPER CASE blog "yelling", but I can't help it. It's just that COOL! I was falling asleep last night at 10:22pm (yes, that was the time exactly because Tim and I both looked at each other like, "who the hell is calling now?") when the phone rang. Neither one of us even thought about it being an early arrival from baby indy, even though just hours earlier we had been teasing Lil' G about the possibility. "I think my water broke" Kim said and it truly didn't sink in with me. I guess I was a little in denial or sleep deprived state, but I just kind of calmly took it all in and relayed it to tpd. He was all like, "are you awake? Do you realize what your saying?" In all honesty, it wasn't until about 1/2 hour later that I was like - whoa - they're really going to have the baby soon - like not in a month, but in a 24 hour time span and then I was awake and soooo excited! I spent most of the night waiting for news, texting them back and forth (and when I say them I mostly mean Kim - that girl is a lean, mean, labor texting machine) and watching Poker after Dark (I highly recommend this for late night baby feedings or insomnia). I was super tired from a rough night with Shane the night before, but I was too excited to sleep. It was a great night - so exciting and so much fun getting the next ding of a text message. I got the call shortly after 5am that the baby would soon be here and as I managed to drift to sleep one last time I was actually dreaming about the baby and got the news it was a girl in my dream only to have my brother call a few minutes later telling me that I was correct - a little perfect brand new babygirl was here and I could come meet my niece - Amelia! Congratulations little bro and sis-in-law! I'm so happy Amelia is here and everyone is doing well (albeit a little shell shocked from her abrupt arrival) but happy and healthy and what more could we really ask for? Love you guys and love my little pretty niece! Here are the rest of the pics I took at the hospital. Oh no, why John why? Oh wait - it couldn't be so you could score a big fat VP nod, could it? Oh! The Hillary humanity of it all! talented Uncle Mark and available only at ElectionSwag.com! The very first day in the hospital, I looked at Shane's little umbilical cord and actually dreaded the day it would fall off. Well, today's the day. Tim did a happy dance (no more folding down the diaper and dealing with all the other boy "parts" that we are so terrified by) but I felt a little "oh my baby's already growing up" sadness. Hope everyone had a great Mother's day! I'll post a few pics of what my KIDS (even though I don't know if Shane pulled his weight this year being 9 days old and all) did for me. One of the pictures Bridget made for me at school. You can see the handprints in the photo below. Too cute! My new Phil & Ted's double jogging stroller. I was TOTALLY shocked by this present! Thanks TPD (and thanks Kim for the help), I absolutely love it! With the both of them - two babies, two years, two mother's day! Crazy, but so much fun! 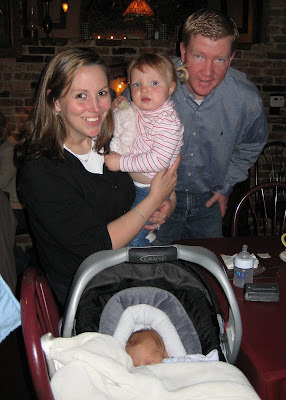 At our Mother's Day brunch at Nicoletti's - it was yummy! I posted more pics up at picasa of all the fun festivities. On one other note, this year was a little bittersweet for me as I remember last year at this time when we lost Karla on mother's day. I was actually at the exact same plant stand this year when it hit me that was exactly where I was one year ago when I got the call that she had passed away. I think Mother's day will always remind me of that, but I will use it moving forward to remember what a fun and spirited mom she was and to honor her memory on this day, too, just like all other moms. Karla, you were and still are a great mom and your spirit is remembered every day in your two beautiful kids. Hope all the mom's out there had a great mother's day! After an incredibly hectic morning (not enough time right now to even begin to describe this morning) we finally get things settled down and Shane and I set up for breakfast - hey, if he's gonna eat, you better believe I am too - I flip on the tv to the very beginning of a segment entitled, "How do you handle change?". A full 5 minutes devoted to working on change in life and dealing with the first 30 days and how that time period makes the biggest difference in how you are effected with the change. It was a pretty good segment with some good advice. I guess it's true what they say - God works in mysterious ways, and in this case it was right through Al Roker. Thanks God and thanks Al, I needed that little boost this morning. 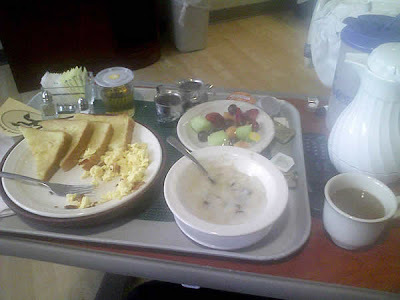 Room service lady (aka Evil Post-Partum Mom Eating Police): "Hungry girl, aren't you? Is this all for you?" Post-partum, free-to-eat whatever I want Erin (as thought in my head): Oh, I'm sorry lady, were you woken up 6 times last night between a hungry hungry baby, percocet delivery and blood pressure readings? Do your "girls" (as they will be referred to from here on out concerning all breastfeeding posts so as to minimize my embarrassment) hurt so bad you want to cry every time they bring said baby to you? Was the only thing that kept you going during those sleepy, painful times the thought of that first Vanilla Latte and French Toast? As actually said: "Yup, pretty hungry." It's day four of Project Baby #2 and if you didn't hear the name saga, I'll be sure to write up a blog about it sometime... maybe in about 20 years, but we are very happy with the name we selected and feel it already fits our little guy perfectly. Since I have a minute (read: still in hospital where they bring me food when I want it, take the baby when I need rest and generally pamper me silly), I thought I'd share Baby Shane's webnursery first pics and give a quick update. "OH! It makes sense now, the laws by which the states of physical systems undergo change are not affected, whether these changes of state be referred to the one or the other of two systems of co-ordinates in uniform translatory motion. That Einstein guy is da BOMB"
Click here to view all of the web nursery photos! Such a baby, isn't he?! Thursday, April 24th, 2008 - The night of the Buffett concert! Thursday, May 1st, 2008 - meeting Baby Shane! 7 pounds, 9 ounces 20"
I'll upload photos and more info tomorrow! ps - Thanks so much for that great welcome, A-LE!!! You guys rock!